Have you seen the NEW Happy Jig collection from We R Memory Keepers in action, yet? If not, you need to get on that, ASAP. When I was at the CHA show this year, the Happy Jig was quite possibly my favorite new tool. 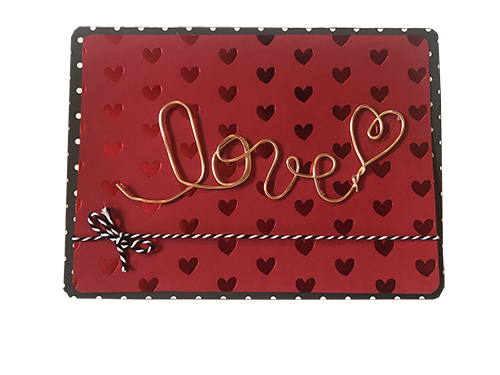 The way it works is you use the wire-bending tool kit to bend wire with the use of a peg board to make into fun and interesting designs. The kit comes with various sized pegs, a base that has a bunch of little holes in it, wire crimps, a booklet with designs, and three lengths of wire to get you started. I highly recommend picking up a few more colors of wire or try the multi-packs, like Colored and Neutral. These designs are addictive to make, so you're going to want plenty of wire! Each design will tell you exactly where to place each peg and what size you will want to use. The directions also indicate which way to wrap your wire around the pegs. It may seem a little tricky, but after you do the first one, they get easier as you rely less and less on careful attention to the instructions. The booklet has a fun variety of designs to get you started, but limiting yourself to that is no fun! You can make original designs, find other people's designs online, or just go to the Happy Jig Instagram page (they are always adding new designs). If you are the creative type, you will definitely want to make your own. The first design (the Love phrase) I made came from the booklet. My biggest challenge was finding an adhesive that would secure the wire to the paper, without showing glue in the final product. After a few failed attempts to glue it down, I used mini glue dots and it held it on perfectly. Tip: even the mini ones are too wide, so I folded them in half and they were completely hidden behind the wire. 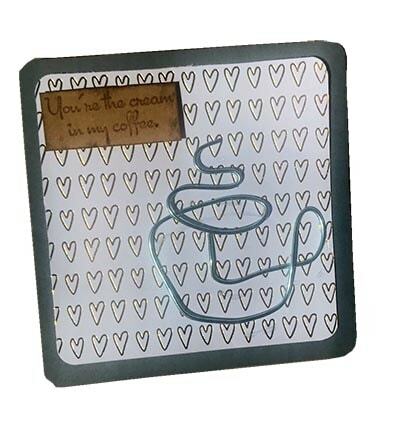 For the second card (the steaming coffee mug) I made, I got the design from the aforementioned Instagram page, I thought the design was super cute and I couldn't resist picking this one. This card is 4" x 4" and the phrase You're the cream in my coffee was from a random stamp I had in my stash, I couldn't tell you where I got it. I love how this card turned out! I can't wait to see what you have created with the Happy Jig so lets see them! Inspire us with your projects by sharing them on our Facebook page. Also, most people will read right over this, but did you know we have a secret deals page?